The serviceware designer at Grant Achatz's new bar went from fixing locks at a medieval Czech castle to transforming the way you consume cocktails. At Martin Kastner’s West Side industrial design studio, Crucial Detail, work tables are covered in molds and paper mock-ups, and stacks of orange buckets sit on scuffed floors. It’s drafty and a little messy—the opposite of what you’d expect given Kastner’s sleek, sophisticated designs: self-supporting stainless-steel skewers that look like antennae and cratered porcelain plates on which Grant Achatz serves his pristine yet Mad Hatter–esque 25-course meals at Alinea. But tidying his studio is the last thing on Kastner’s mind. As designer of the serviceware for the [node:148751 link=Alinea;] team’s new bar, Aviary, slated to open at the end of this month (adjacent to the restaurant, Next), he’s preoccupied with a ceramic mug he created for hot cocktails, four versions of which sit on a work table. To most people, the intentionally lopsided, ribbed ceramic cups look identical. But to Kastner, who’s testing variations in the porcelain’s finish, the subtle differences are one of those crucial details (hence, the studio name) that shapes the drinker’s experience. Kastner returned to art school in Prague, where he studied jewelry design. While in school, he met his future wife, Lara, an American expat who brought him to Columbus, Ohio. Unable to find work as a blacksmith in the States (imagine! ), he started Crucial Detail—part job shop, part design studio and part fabricator. On occasion, he joined Lara to roll dough for her night shift at a bakery. It was then that Kastner started thinking about the intersection of food and design. “The thing about food is that it’s a cultural medium and at the same time, nutrition we need. It’s kind of unexploited in a sense,” he says. Kastner asked the pastry chef at the bakery if there was anything the chef couldn’t do using the tools already available; all the chef said he needed were a few basic stainless-steel cake molds. Though the request didn’t inspire much creativity, Kastner made the molds. 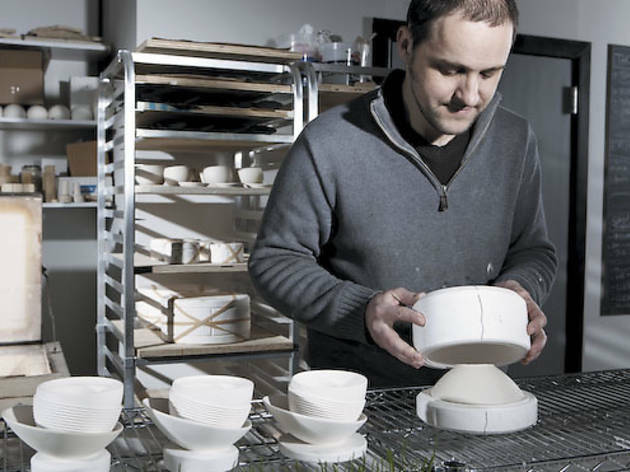 Kastner received an e-mail in 2003 from Grant Achatz, then a chef at Evanston’s Trio, who was looking for an industrial designer to envision new ways of presenting food. Of the 47 designers Achatz contacted, Kastner was the only one who replied. For a trial run, Achatz presented him with the problem of how to serve a flavored ice ball; Kastner replied with about seven designs. “Each design he submitted was a little more avant-garde,” Achatz says, explaining how Kastner clearly had his mind set on the most out-there design but was acclimating Achatz’s palate by first introducing less-challenging versions. Between 2003 and 2004, Kastner and Achatz collaborated on three designs for Trio, followed by dozens more for the launch of Alinea. Meanwhile, Lara started documenting Achatz’s dishes (her photography appears in Achatz’s self-published 2008 book, Alinea, which Kastner designed), and in 2005, the couple relocated to Chicago to work with the Alinea team. Thirty design collaborations later (as well as the menu and website design), Kastner’s serviceware is as central to the Alinea experience as the food. The six-pronged sugar tongs have even become a purloined keepsake for sneaky diners who slip the utensil into their bags. Kastner says his design process begins with distilling either a concept or question into a simple sentence. Like this one: Say you have an egg-shaped ice cube, with alcohol inside, resting in a glass: How do you break the ice egg and release the liquid without harming yourself—or the glass? Kastner’s team’s answer (he works with two production coordinators): a rubber band threaded through a stainless-steel disk and looped into a figure-eight shape; the drinker pulls the rubber band back like a slingshot and releases the disk, splitting the ice without splitting a finger. Speaking of extremes: At Aviary, ice will come in about 18 different shapes, including a perfect quarter-inch sphere. The spheres are frozen in Kastner-designed silicon tray molds, each of which produce 2,000 tiny ice pellets. A single drink requires about 1,500 of them. “I can’t pretend this stuff is practical,” Kastner admits. “I create problems.” Luckily, they’re good problems to have.